A field height is an object, specifying global water areas where height should be changed (for wakefields, water disturbance, etc.). Global water object has heightmap for waves and FieldHeight has its own heightmap. Inside the field, the heightmap of the global water is gradually changing from the center of the field height object. A field height object will affect water only if the FieldHeight interaction option is enabled on the States tab of the water_global_base material. FieldHeight objects work fine with particle systems and decal objects. 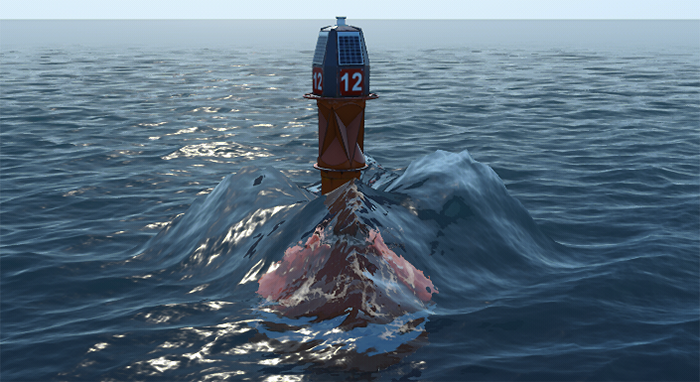 Water disturbance near the buoy is made by using FieldHeight object. A FieldHeight class to create a FieldHeight object by using C++, C# or UnigineScript API. A render_field_height_resolution and render_field_precision console commands. On the Menu bar, choose Create -> Water -> Field Height. Place the height field in the world so that it intersects Global Water object. 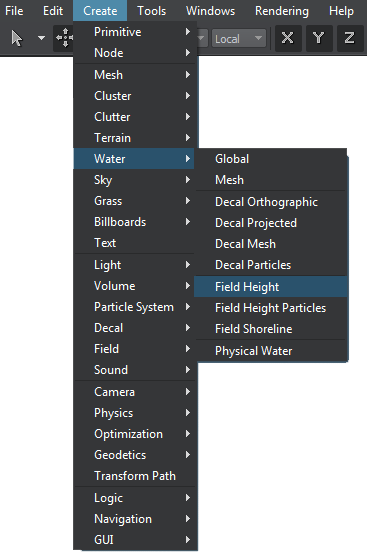 Make sure that the FieldHeight interaction option is enabled for water_global_base material. Go to the Field Height tab of the Parameters window and set up necessary parameters. After adding a FieldHeight object to the scene, you can't see any changes of the global water object because FieldHeight object doesn't have any default heightmap texture. A field mask. A bit mask that specifies an area of the height field to be applied to water. The height field will be applied to water only if they have matching masks. A viewport mask. A bit mask for rendering the height field into the current viewport. For the height field to be rendered into the viewport, its mask should match the camera viewport mask. Size of the height field along the axes in units. An attenuation factor indicating how much global water object's heights gradually changing from the center of the height field. The higher the value, the less FieldHeight's heights will have influence on the Global Water's object heights. Power parameter is a multiplier for FieldHeight's heightmap texture values. The higher the value, the more FieldHeight's heights will have influence on the Global Water's object heights. Rendering order of the Field Height. 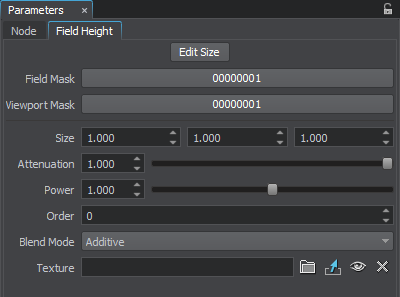 This parameter is used to properly apply fields with mixed blend modes. Bending mode of the Field Height. Available values are Additive, Multiplicative. It is used as a multiplier for the Additive mode. lerp(1.0f, value, attenuation) is used for the Multiplicative mode. Heightmap R16 or R32F (1-channeled) texture (controlled by the render_field_precision console command). Heightmap texture is used to create an additional height displacement for water surface.